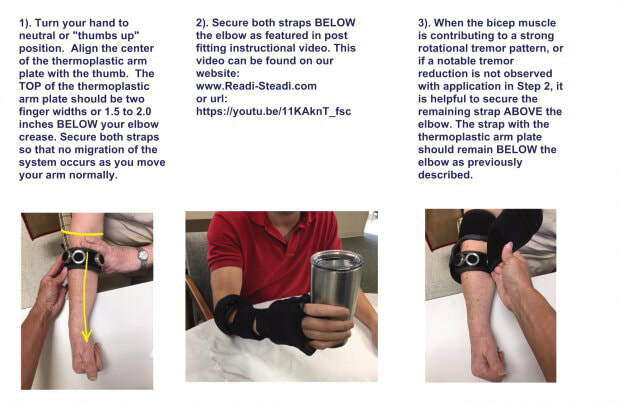 Help us help your patients control mild to severe hand tremors. ​On-line availability with video assessment has proven success. Referring physicians can fax a signed order (click below), be sure to include a dx code and patient email address, along with clinical note documenting the patient's tremor, front and back copies of patients’ primary and secondary insurance cards and patient demographic info to 833-513-0978. (or you can upload above) After we receive the signed order and clinical note, the referred patient will receive an email with detailed instructions regarding the online application/ authorization form and video request. Please ask the patients to check their email daily. Our office manager will verify each referred patient’s insurance benefits prior to custom fitting. As stated above, due to the custom nature of each glove, we need to assess patients’ individual tremor patterns. This allows for optimal fit, proper selection of small weights, and proper placement of weights providing a pressure touch sensation directly over contracting muscles and tendons. 2). Balance owed after insurance, based on individual policies and deductibles. Thank you for choosing Readi-Steadi®, we are pleased to have your trust as we remain committed to assisting you with your patient’s care and success!